3. Isn't had to believe that in sixty years of existence and a previous solo series and a re-surgence in Birds of Prey and JLofA, that it's taken this long for Black Canary to recieve a new series? 4. Isn't nice to see Black Canary artist Paulo Siqueira draw kids as something other than short people with round heads? 5. DC, why would you give away the new Batman and The Outsiders line-up in a house ad, a month before the Outsiders: Five Of A Kind weekly event? 6. Did you know that if you bought Action Comics #851 in 2D, you lived a little less that day? 8. Wasn't last week's Supergirl, in she apologizes for being a jerk, just the sweetest thing? 10. Black Mary's getting kinda creepy, isn't she? 11. Are Trickster and Pied Piper the Booster and Beetle of the villain set? 13. Wasn't it great to that despite all that, writer Andy Diggle still showed he possessed the moral center to become a hero? 15. After reading Green Lantern: Sinestro Corps #1, Green Lantern #21 and Justice Society of America #7, Geoff Johns is truly back in fine form, isn't he? 17. How cool was it seeing The Justice Society of America's former leadership thinking they were helping out Citizen Steel by giving him what he wanted? 18. 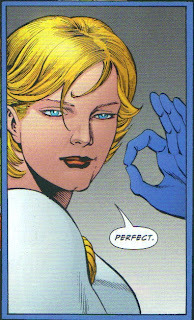 How much cooler was it seeing Power Girl, not tip-toeing around Citizen Steel, zeroing in on the problem aand giving him what he needed? 19. Aren't we glad that The Lightning Saga's over so that we can have more stories like this one? 20. She's gonna make a great leader, ain't she? Re: #3, Black Canary had a solo series in the 90s. That's where she met The Ray and he developed his crush on her. I totally forgot about this one. #1 - I think the ex-husband is from the first Birds of Prey special, isn't he? Am I crazy, or was that 20 questions and no statement? And I'm happy that we're finally going to see John Stewart on a semi-regular basis. I am crazy. I didn't notice the 'pffft' somehow. I apologize for my previous comment. And in regards to Dinah's ex husband, and chance for a deviant post on who in the DCU has slept with who? "15. After reading Green Lantern: Sinestro Corps #1, Green Lantern #21 and Justice Society of America #7, Geoff Johns is truly back in fine form, isn't he?" I'm guessing alot of that has to do with his long commitment to 52 finally being over. The end of the weekly series seems to match up with his upsurge in quality. Black Canary's ex-husband first appeared in 'Birds of Prey: Wolves'. "9. How creepy is it that Athena just walks the streets looking for women "
I don't think it IS Athena. It's Granny Goodness in disguise. I totally agree about Johns and The Lightning Saga. There was a time when he was unquestionably one of my favorite writers. I'm glad that time is returning for another stint.